Apple CEO Tim Cook took time out of his China tour this week to speak with a local news publication about the company's regional intentions, saying Apple is planting deep roots in the country, from job creation to economic and environmental investments. In an interview with Caixin earlier this week, Cook sought to dispel sentiment that Apple's interest in China begins and ends with the country's massive economic potential. With a booming middle class keen on owning the latest and greatest electronic devices, China has quickly become the world's largest smartphone market and thus an increasingly important factor to Apple's bottom line. While China is viewed as Apple's most important growth market, recent analysis shows sales of the company's flagship iPhone are under pressure from regional upstarts like Huawei and Xiaomi. In a bid to more deeply entrench itself, and its culture of innovation, into the Chinese zeitgeist, Apple is spending big on a buildout of its retail presence. This is in addition to investments in research and development, manufacturing and environmental initiatives. Last week, Apple announced plans to create two new R&D centers in Shanghai and Suzhou, facilities that will join similar outfits already under construction in Beijing and Shenzhen. "We're not just someone who's here to access the market," Cook said. "We've created almost 5 million jobs in China. I'm not sure there are too many companies, domestic or foreign, who can say that. [...] There's deep roots here. I think very highly of the country and the people in it. We're here to stay." Apple's investments are designed around the development of its various products. Cook told the publication that there are now 1.8 million developers in China crafting apps for iOS. As a global platform, Chinese developers have the opportunity to market their wares not only to locals, but to a worldwide audience. Cook went on to offer color on comments about globalization made during a speech at the China Development Forum, a conference sponsored by China's central government. "My view on globalization is that you can think of three groups of people," Cook said. "There's a group of people that globalization has helped tremendously. There's a group that globalization did not help. There's a group of people that globalization hurt. Globalization has lifted hundreds of millions of people out of poverty. But I also recognize is that it did not help everyone." He went on to say that socioeconomic inequities and other issues caused by globalization can be fixed, but it is up to lawmakers to first admit these problems exist. Globalization is a contentious subject for companies like Apple, which are based in the U.S. but farm a bulk of manufacturing overseas. President Donald Trump recently called for Apple to produce iPhone and other products in American plants. While Apple's main manufacturing partner Foxconn is mulling a joint investment to build displays in the U.S., that effort pales in comparison to iPhone and iPad production operations in China. 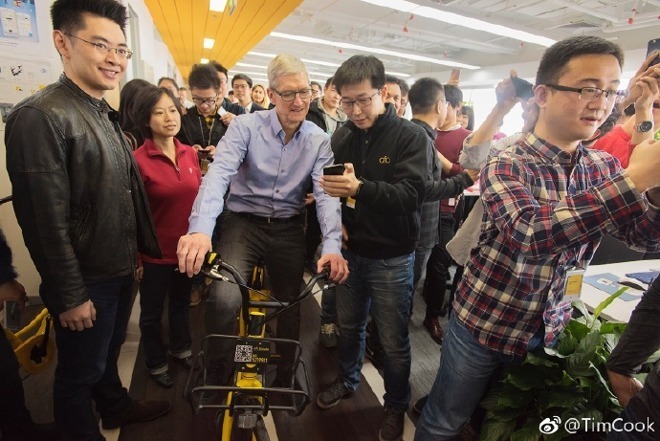 While in China for the economic summit, Cook visited with local businesses tied to the iOS ecosystem including bike-sharing startup ofo and fitness app Keep. Ofo, which is in a fierce fight for investment capital, is backed by Didi, the ride-sharing service in which Apple invested $1 billion last year.